Too many strawberries? Strawberries are very easy to freeze. When preparing strawberries for the freezer, make sure to choose berries that are firm and free of imperfections. Wash the strawberries in ice water a few at a time, and then gently remove the hulls. 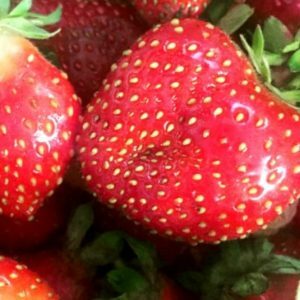 There are several ways you can prepare strawberries for freezing. You can freeze them whole, or use a sugar pack or syrup pack. To freeze strawberries whole, freeze washed and hulled strawberries on cookie sheets and then store them in freezer bags. To prepare strawberries with a sugar pack, slice them into a bowl. You can crush them if you want, depending on what you are going to be using the strawberries for when you take them back out of the freezer. Sprinkle the sliced strawberries with 1 cup sugar to 4 cups fruit, and gently stir to coat. Freeze in sealed containers. To prepare a syrup pack, the syrup should be made up of 50% water and 50% sugar. Bring mixture to a boil to dissolve sugar, and then cool before pouring into containers. Pack strawberries and syrup in pint containers, leaving 1/2 inch head space. If you would like to prepare your strawberries without sugar, just add water to the strawberries in the place of the syrup. You can also use artificial sweeteners like Splenda in place of sugar to prepare your syrup. Determine the amount of Splenda to use from the package directions. Seal containers and freeze. 1 Comment on "Freezing Strawberries"
Love your ideas. they are so easy for beginners like me. I will be watching and reading from now on. Thank you so much. I feel like I just ran into the knowledge tree. Thanks again.